The European Commission is due to unveil its autumn economic forecasts on Friday, but El País has already seen a draft of what the Spanish government is going to be told - and, unsurprisingly, there seems to be no good news coming from Brussels. First off, the Commission is going to confirm that the growth forecasts used by the Spanish government to table its budget for next year were overly optimistic. According to the Commission, the Spanish economy will contract by 1.5% of GDP next year - three times higher than the 0.5% the Spanish government was betting on (or maybe we should say 'hoping for'?). Incidentally, we also flagged up this weakness in the Spanish budget for 2013 when it was presented at the end of September (see here). Unfortunately for Mariano Rajoy and his cabinet, though, the bad news does not end there. The draft seen by El País also shows that Spain is set to miss all the deficit targets agreed with Brussels until 2014 - and not exactly by a whisker. Worryingly, the Commission believes Spain's deficit at the end of 2014 will be 5.8% of GDP - with the target set at 2.8%. In other words, Spain looks set to fail to bring its deficit below the threshold of 3% of GDP enshrined in the EU Treaties, even after being granted an extra year to do so. If confirmed, the Commission's forecasts will deal another blow to the credibility of the Spanish government - not least because Madrid decided to stick to outdated growth predictions to table its budget for next year, despite the IMF and others clearly warning that the recession was going to be much worse. The official figures will be out on Friday - and we will post a more comprehensive analysis then. Given all this then, it is a slightly ironic day for Spanish Finance Minister Luis de Guindos to publish an op-ed in the WSJ under the headline, "Spain's future is bright. 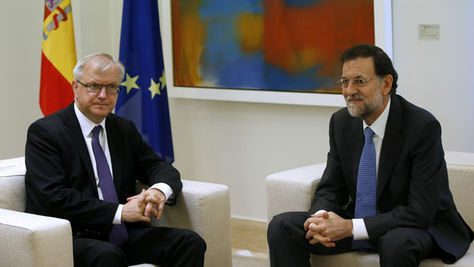 Nobody in the international arena doubts the bold determination of the Spanish government." These figures suggest differently, and we expect Spain could find an increasingly impatient audience at meetings with other eurozone countries, especially after its decision to block the appointment of Luxembourg's Yves Mersch to the ECB's Executive Board. I do like your expression: 'credibilty of the Spanish government'. Its just the "credibility of the Spanish Government" that is questionable, the EU Accounts have not been signed off for the 18th year running. Not much credibility there either. Difficult to see why Europe's politicians put op-eds in papers like the WSJ (and why these papers put them in unless of course they are compensated by a lot of advertising revenue). Like here it looks like a bad commercial that even a mentally challenged Spainiard would not believe. While you present your case for a very intelligent and above all cynical audience. The right audience only the completely wrong way to present things to them. Same why these papers allow this most of the time complete nonsense in their papers. Simply not good at all for the credibility of the paper. Simply why allow your paper to be used as a platform for what is factually most of the time very dubious. To show you are so important that Ministers want to write in it? It looks clear that giving good factual info is much more important to the standard reader. Have a proper slightly critical interview that does both. This way it simply gives the impression you are on the take. And the country should bring proper factual info this way it simply looks they have something to hide iso of something to tell. You start a PR offensive usually when one is needed and this clearly confirms it. I have an idea: Let's install a Technocrat prime minister and form a compeltely unelected "government."